We’ve had some interesting exhaust builds in recently. They’ve consisted of the usual fitting of universal back boxes and mild steel exhaust builds for those cars where a standard replacement is hard to come by. We’ve also had a fair few stainless replacements for standard items too. Generally most of our exhaust work is for standard sounding exhausts which will last a lot longer, look a lot nicer or just sound a bit fruitier without upsetting the neighbours. We did a lovely build on a Peugeot 206 gti which was suprisingly quiet given the power output. The total price for their lifetime guaranteed stainless exhaust was less than a standard peugeot replacement! 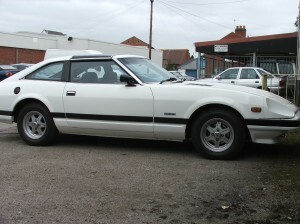 We had a lovely old Datsun Z car in for a stainless build which had a lovely deep note only a big capacity engine can give you. Talking of big capacity we also had an exhaust build on a tractor of all things, again saving the owner several hundred pounds over a standard replacement. This entry was posted on Monday, July 20th, 2009 at 11:18 am	and is filed under Exhausts. You can follow any responses to this entry through the RSS 2.0 feed. Both comments and pings are currently closed.